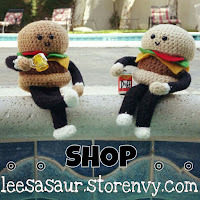 LEESASAUR makes lots of original crochet pieces by hand with love. Somewhere on an island beneath the depths of the equator, emerged LEESASAUR, an artist certain she was of the reptilian species. 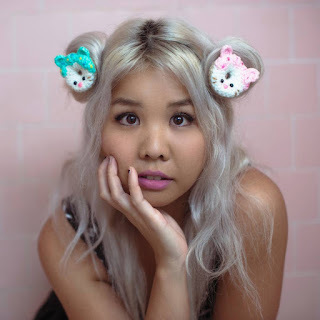 With her primary medium being yarn, Leesasaur crochets a variety of creations ranging from popular iconic-video game and movie characters, to her own tragically cute "Damaged Goods" and "I Agore You" lines. Inspired by an overwhelming amount of feelings, and need for tangibility, Leesasaur strives to create pieces that will ultimately bring happiness. Every project is her own pattern and engineering. Now you can SHOP for Leesasaur projects, and read about her latest doings and stories behind her work here, at LEESASAUR.COM. You can check out her animations on her YOUTUBE channel, and write to LEESASAUR[at]GMAIL[dot]COM. Don't forget to like LEESASAUR on FACEBOOK, tweet her at @LEESASAURCAVE, and follow her at @LEESASAUR!